Students can now become members of NATS and partake in many of the benefits that their teachers enjoy! Mentoring and serving students is at the heart of the NATS mission. We are dedicated to the development of life-long learning beginning at the student level and continuing through professional employment. It is in this spirit that NATS has launched a brand new student membership category for 2017. With nearly 7,000 industry professionals located across more than 30 countries, NATS is the largest association of teachers of singing in the world. We enthusiastically welcome students to become part of a community of friends and colleagues who all seek the same goal: excellence in teaching and singing. 1) Must be a full-time student pursuing an undergraduate, graduate or doctoral degree at a post-secondary institution. (NATS may request a verification of your full-time student status). 2) Must be a brand new member. Affiliate, Associate or Full members may not revert to Student Members of NATS. NATS Chats: live online real-time discussions for voice teachers and singers. Topics vary widely and have included classical and non-classical vocal technique, vocal repertoire, teaching strategies, business strategies for private studio teachers, resources for university teachers, and arts advocacy. Guests have included prominent teachers, authors, composers, and artists. Networking: NATS events (chapter, district, regional and national) provide a great opportunity to connect with other members, many of whom are active in performance as well, and have invaluable contacts in the professional worlds of both singing and teaching. Additionally, student members can participate in and search through our online Membership Directory to help you connect with other members locally and across the world. In addition to being involved with your local NATS chapter, Student NATS members have a unique opportunity for affiliation with a local Student NATS (SNATS) chapter. A SNATS Chapter is an organization of students that can meet, hold events and discussions, participate, practice, and learn more about all aspects of singing. Chapters are formed at the college, university, conservatory or independent teacher level. 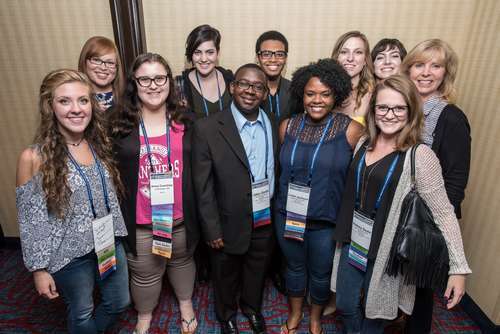 Click HERE to find out more about Student NATS (SNATS) Chapters. A student membership in NATS and membership in a local SNATS chapter is a mutually beneficial way to advance your career development.